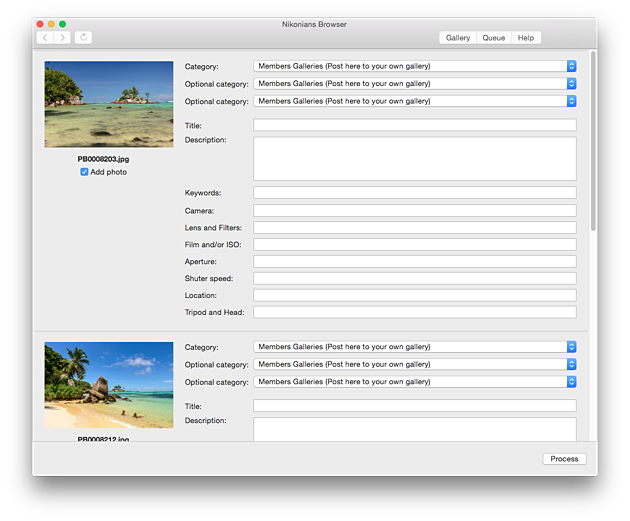 The Nikonians Uploader for Mac, is a Mac OS X application available for Nikonians on a Silver membership or higher, allowing you to easily upload images to the Nikonians galleries directly from your Mac. You can download the Nikonians Uploader in the Nikonians Rewards Program section. The Nikonians Uploader for Mac is a 64 bit application only available for Macintosh users using Mac OS X 10.7 (Mac OS X Lion) or higher using Intel CPU's. 7 Support for older versions of Mac OS X? If you need to change password, you can only do that in the Nikonians.org community (in "My Profile"). Then logout from the Uploader (menu: Nikonians Uploader/Logout) and enter your authentication data again. With the Nikonians Uploader, you can upload one or more images easily to the Nikonians galleries. 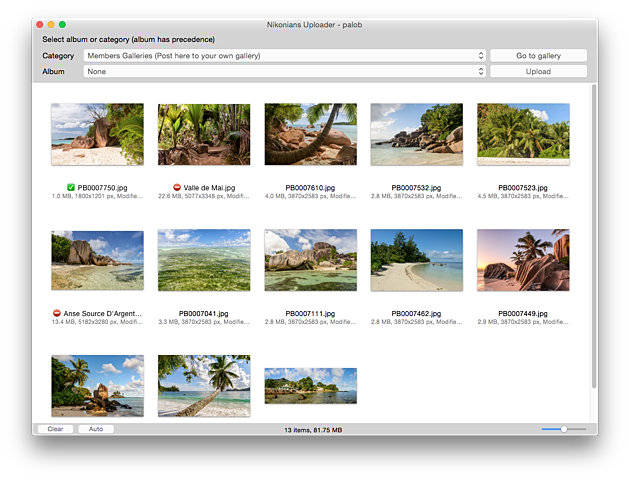 Just (1) drag & drop the image(s) you want to upload to the open window of the application, (2) select where they should be uploaded and (3) hit the "Upload" button. 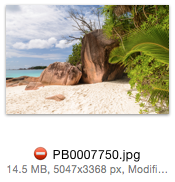 Nikonians galleries refuse images or videos larger than 10MB in size. The maximal resolution of an image is 1800 pixels long side. To allow uploading images from modern cameras, Nikonians Uploader can downscale the image before it hits the galleries, thereby giving you more control of the resizing procedure (instead of letting the galleries do the resizing, which is not done with any extra sharpening). 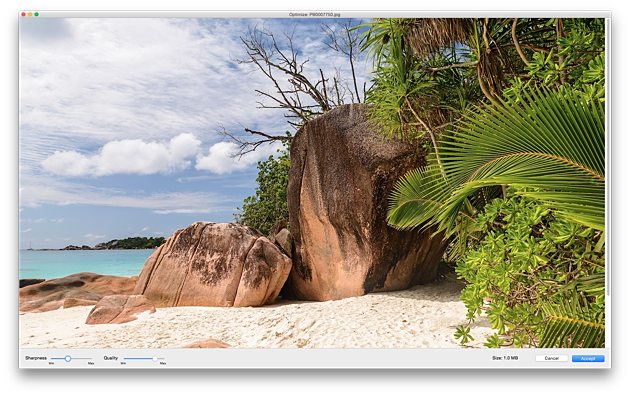 It is possible to tweak sharpening and compression and see the results in real time, allowing you to judge if the image is potentially over sharpened or if there are compression artifacts visible. Please note: This process of changing the size and sharpness of the image is not affecting your original image, which you placed in the Uploader's window. A temporary copy of the image is made and used for storing all changes. When you are satisfied with the changes, hit the “Accept” button and the thumbnail description changes accordingly. Please note: This mark does not mean that only optimized images can be uploaded, rather any image without any mark may be uploaded as well. Images marked indicate that they might hit the resolution limit at Nikonians galleries and that they will be downsized in the galleries after the upload. Doing that, leads to longer upload time (you are uploading a larger image) and it does not offer any possibility to review how the image will look like when resized. We strongly suggest you resize your images prior to upload, for example in the Nikonians Uploader. It is possible to return to the Optimizer and modify its previous settings. It will use any previously accepted values, but will reload the original image, so that there is no degradation of image quality. If you are not satisfied with the new values, simply hit the "Cancel" button and the previous values will be reapplied. It might be tedious to optimize all images individually. It is possible to perform batch optimization by using the "Auto" button. All selected images (or all images if none is selected) will be processed. It is possible to review and tweak the automatically processed images afterwards. Just double click on any individual image to open it in the Optimizer dialog. As soon as you hit the "Upload" button, your images will be uploaded to Nikonians. Please note, that the images will be placed in the image upload queue in your gallery and a new dialog opens with the queue showing after the upload has been done. You can now fill out any additional information you want to attach to the images. If you are happy with how things are, just hit the "Process" button at the bottom of the dialog. To avoid long processing times, the queue will show at the most 10 images. Additional images will be displayed only after processing the actual set. Should you want to open the upload queue in the galleries manually from the Uploader, simply click the button "Link to commit" and you will process the queue - if there are images still to be processed. You cannot create albums directly out of the uploader. If you want to create albums, you need to do that from the regular gallery web page. We are planning on including album creation in an upcoming release. Support for older versions of Mac OS X? Nope, we are not supporting Snow Leopard Mac OS X 10.6 or older versions. This page was last modified on 17 April 2017, at 09:26.